Our pick of the best mountain bike clipless pedals, designed for mountain bikes these clipless pedals will keep your foot in place over rough ground. Attached to your shoe the small SPD style cleat fixes with two bolts. 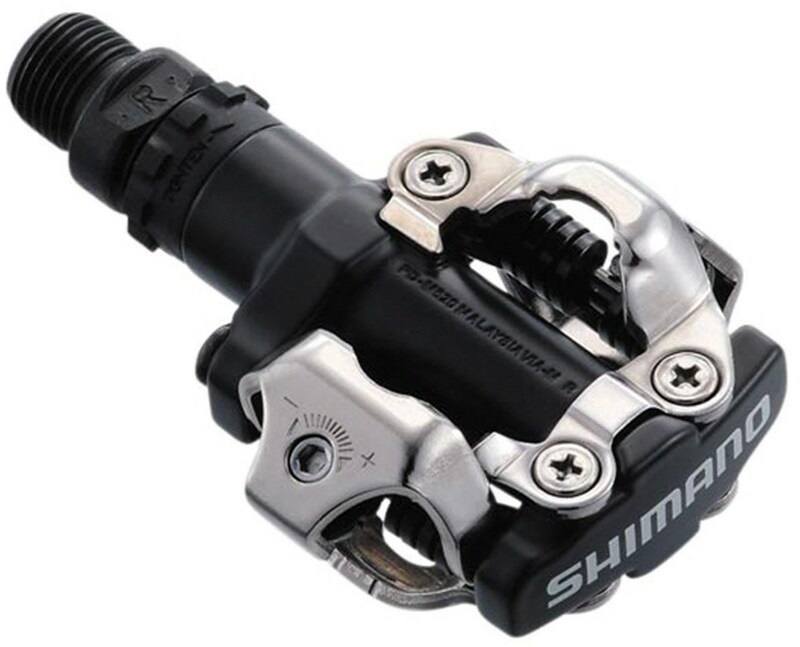 Pedals that use the two-bolt cleat system are commonly called SPD (Shimano Pedalling Dynamics), Shimano being the primary brand for this system. 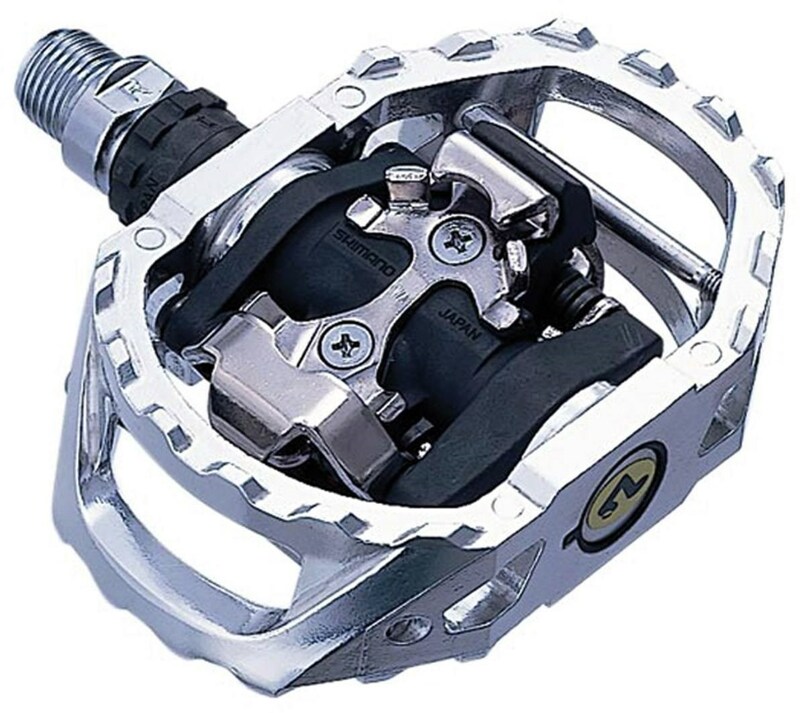 Click here to see our full range of MTB Clipless pedals. MTB clipless pedals let you connect your shoes to them, for greater power and control. Although they are traditionally off-road pedals, there are many styles of mountain bike shoes available so are popular for leisure and commuter riders. They are easier to use and to walk in than road clipless shoes. To use clipless MTB pedals, you will need a pair of mountain bike shoes that take two-bolt cleats. You will also need to attach the right type of cleats for your pedals to the shoes luckily cleats are included with pedals. Let’s look at our pick of the best MTB clipless pedals. The simple, robust and value for money. A Shimano SPD pedal in its purest form. The ideal MTB clipless pedal for beginners with easily adjustable tension using the small allen key screw. For those wishing to investigate the world of riding clipped in, these would make a great choice with their exceptional value. Proven in the UK mud to keep working with minimal servicing. Though traditionally a small platform cross-country pedal they are not just limited to mountain bikes. These pedals will be seen amongst tourers and commuters as well as cyclocross riders. Cup and cone bearings make them easily serviceable. Cleats are included with this pedal, as is the case with all clipless pedals. A classic and one of the best value pedals out there if you want a no-nonsense double sided SPD pedal for any type of riding -Road.cc. Offering more protection against rock strikes while providing a wide platform for your foot. The clipless mechanism is angled on a spring within the cage of the pedal, lifting the front to make it easier to locate the cleat and clip in. Unlike the M520 above, the extra cage around the mechanism provides some platform for your foot should you not clip in the first time. The Shimano M424 is a lighter plastic version available at a lower price. This aluminium caged downhill/trail pedal is very robust so do weight a little more, though they have proved their strength over the years. The larger platform on this style of pedal does mean that riding with a normal street shoe is possible though not ideal. A level up from the M545, DMR take their already class-leading mountain bike pedal knowledge and apply it to clipless. The mechanism floats front up to aid engagement. Compatible with Shimano cleats though does come with DMR’s own set. 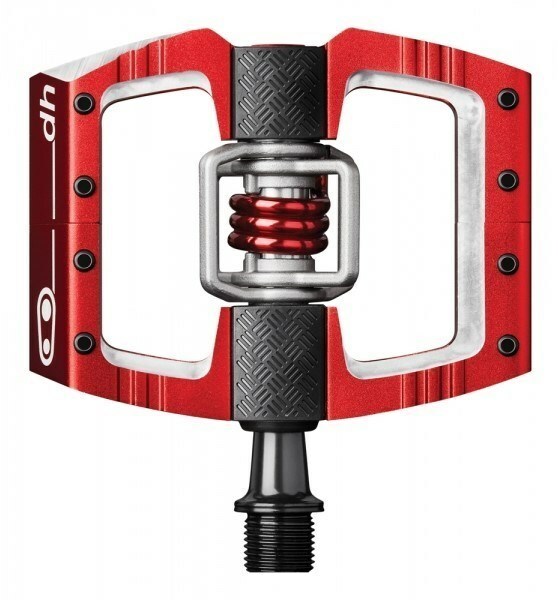 The platform area is large providing lots of stability around the mechanism making this pedal ideal for downhill and aggressive trail/enduro riders. DMR supply alloy plates to adjust the height of the nylon “bumper” as well as replaceable pins so the pedal can be tuned to your personal preference and feel. Often voted to the top of any grouptests the Mallet from Crank Brothers is now a staple on DH/Trail/Enduro bikes. The platform is large and slightly concave giving great feel and security. Now with the traction pad, the feel is even better underfoot. The Crank Brothers clipless mechanism is very good at shedding mud and will keep engaging in the worst of conditions. A wide and adjustable release angle lets you be active on the bike before the shoe unclips. Tough and built to last, an aluminium platform with stainless steel wings. Inner glide bearings with reliable outer Enduro bearings and a double seal system keeps things spinning smoothly. Adjustable pins and a lightweight for the size set the bar high for other manufacturers. The Mallet is fully user serviceable, brass cleats are included with zero-float cleats are available separately. At the very top end of the spectrum where the ultimate in function and weight saving matters are the Crank Brothers Eggbeater. Available in four versions with the entry level at around £50, the Eggbeater is the most minimalistic cross-country MTB clipless pedal available. With no cage at all the ultra-efficient four-sided mechanism copes with mud incredibly well. This top of the range titanium version only weighs 179g per pair. Titanium spindle and wings over a stainless-steel spring make them the choice of professional XC riders. 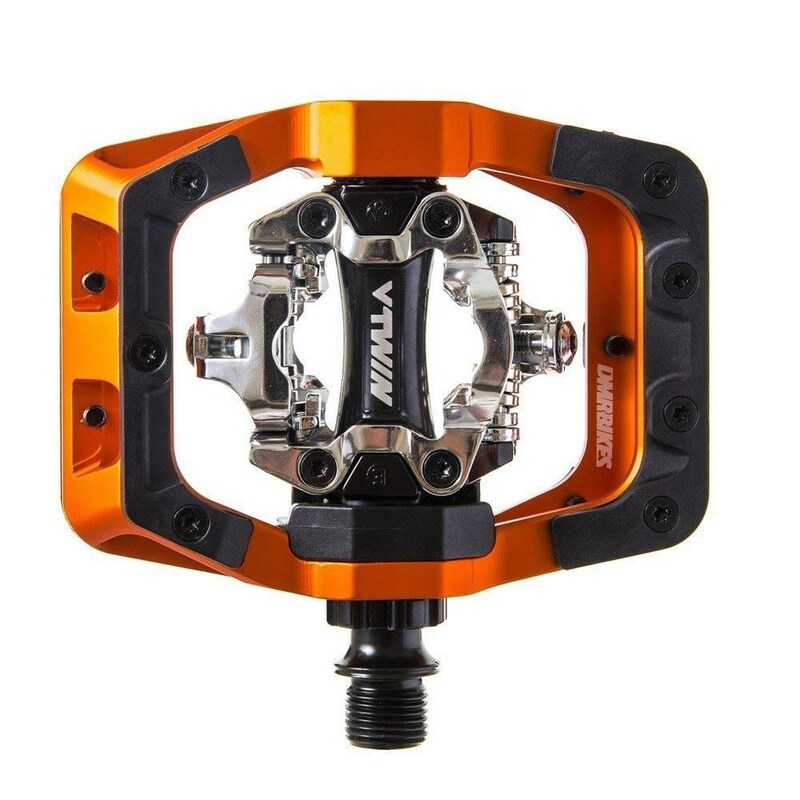 Easy to service these pedals have proven to be long lasting, durable and the ultimate pedal for clipless mountain bike performance. We never unexpectedly unclipped, even during all-out efforts and sprints. This most current version of the Eggbeater pedal offers the most consistent release performance of any Eggbeater. Unclipping is easy and intuitive – Mbaction.com.